Writing Field Trips: Take One Today! Remember when you were in elementary school, and you were soooo ecstatic to go on your field trips? They were exactly what you needed: time away from the grind, wide open spaces to run around… So what if you might have an assignment about dinosaur bones at the museum or animals at the zoo due when you got back to class? For now, you were free! And, chances are, you were feeling pretty inspired. Sometimes, writers need a field trip, too. Not a total vacation getaway, just a field trip. We need to step away from the grind that is our office, get out into the world and make some discoveries, and then bring them back to the stories we’re writing. Just like those elementary school kids, we might feel free. But we really won’t be. We will also have assignments due after the field trip — our stories. After all, for writers, field trips = field research. 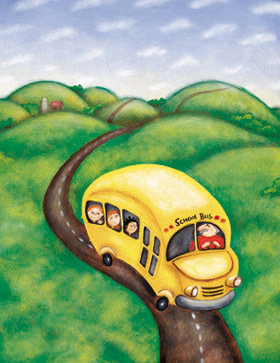 Take a writing field trip today — no school bus required! I’m super excited to take a writing field trip soon. I am going to spend a day in Pennsylvania Amish country to do some research for my next Amish fiction novella, tentatively called Mercy’s Fall. Mercy is on her Rumspringa, and she works in an Amish bakery and does chores on her family’s small farm. She’s also uber boy-crazy. During my field trip, my goals are to visit an Amish bakery, cruise around the farmland, and try my hardest to see, and maybe talk to, some Rumspringa-aged youth, with a definite eye on the Amish boys. I’ll be looking for traits to incorporate into at least one of the boys Mercy will fall for. And, of course, I’ll be sure to write a blog post about it afterwards. No matter what kind of story you’re writing, you can definitely take a writing field trip — and it doesn’t have to be far away. Writing a survival book? Hike or camp in the national forest an hour from your house. (Just make sure to research what kind of wildlife you might find, and be prepared for it!) Or maybe you live in the suburbs of Chicago and you’re writing a NA novel about college students at the Art Institute. Take the interstate downtown and hang out amongst the artsy crowd. The field trip doesn’t even have to be physical, it can be mental. Most of us write about places we’ve been, and our writers’ minds are turned on all the time. So if you’re thinking of writing a story that takes place in Hawaii, which you visited five years ago, take another look at your pictures, videos, and journal entries. Close your eyes and imagine yourself there. Remember what you were thinking and observing. And the story will flow. I’ve found that this works well for me, and it makes sense — as creative types, we spend a lot of our day imagining things, so taking a mental field trip is not such a far-fetched idea! Have you ever taken a writing field trip? How far did you go, and how did it inspire you? I’d love to hear your stories!